I notice that writer/poet Ben Norris will be appearing on the Adelaide Festival fringe in 2018 with his one-man show The Hitchhiker’s Guide to the Family. I went to see him when he appeared at the Nottingham Playhouse a while ago. I knew Ben slightly when he was growing up – I go dancing with his mum. His one-man show about love and motorways is about connecting with his dad by going on a road trip around the places his dad has lived. At about the same time as that show, I went to see Making Beauty, an exhibition at Lakeside Arts’ Djanogly Gallery by installation artist Elpida Hadzi-Vasileva. She works in an amazing variety of materials and contexts. 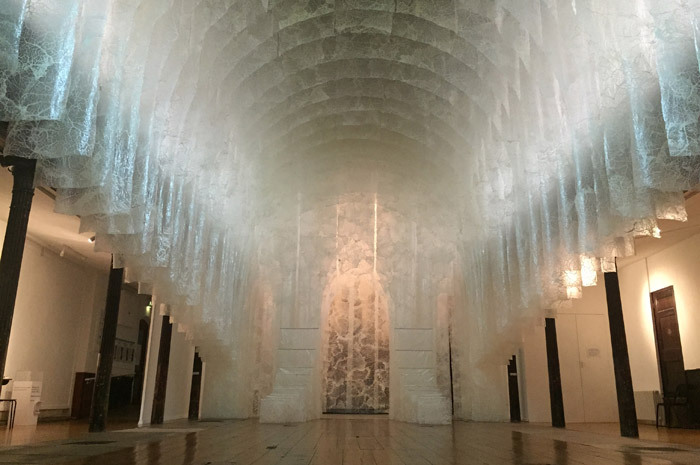 In this exhibition the centrepieces were Fragility – a church-like space (originally designed for display in an ex-church) created from the translucent veils of pig caul fat – and Haruspex – originally commissioned by the Vatican for the Venice Bienniale and a beautiful sacred-like space – created from waste biological materials. She is inspired by architecture, religion, and research into digestive diseases and their treatments. Some of the images, especially the associated MRI scans, reminded me of the images my father made while doing research into actin and other muscle proteins in support of finding a treatment for muscular dystrophy. We had to clear out his house now that he has moved into a care home. Objects – documents, images, reel-to-reel tape recordings of lectures, laboratory glassware, molecular models – from a lifetime of scientific research, enquiry and interest – filled cupboards, drawers and garage. It seemed insensitive simply to throw it all away: it should be celebrated in some way. I studied biochemistry, like him. As Ben Norris went on a road trip to connect with his father, perhaps making art out of these scientific items could help me connect with mine as he gradually loses connections due to the effects of vascular dementia.